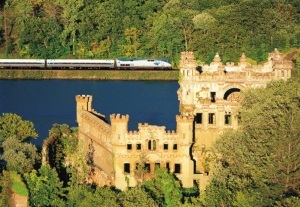 Beginning in Toronto, this tour includes two fantastic rail journeys on Canada’s VIA Rail train. Traveling from Toronto to Quebec City then from Quebec City to Montreal, the relaxed pace of the train is perfect. Board an Amtrak train from Montreal to New York City and explore the Big Apple before heading north to Boston. Enjoy the wonders of New York City and Boston with your included NY Double Decker and Go Boston travel passes. 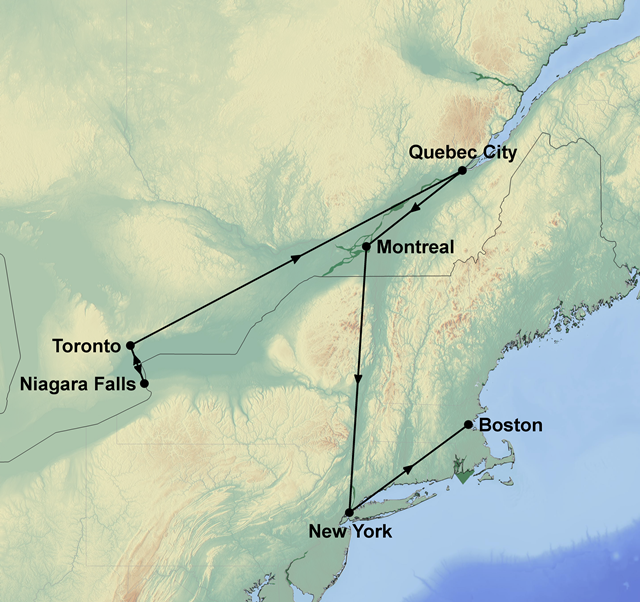 This magical 15-day tour from Toronto to Boston is a great way to experience the beauty of the north-east. Accommodation in clean and comfortable hotels with private facilities, meals as indicated (B=breakfast, L=lunch, D=dinner), Toronto HopOn/HopOff Trolley Tour, Niagara Falls Excursion, VIA RailEconomy fare: Toronto/Quebec City, Quebec City/Montreal, Countryside Tour -Beaupre Coast and the Island of Orleans, Amtrak Economy fares: Montreal/New York, New York/Boston, New York All Loops Double Decker Tour. Experience the sights, sounds and the history of one of the world’s great multi-cultural cities on the Hop On/Hop Off Trolley Tour. Your ticket allows you to see the city with professional drivers and commentary. Highlights include the University of Toronto, Yorkville Village, CN Tower, Skydome, Chinatown and Toronto Harbour-front. Depart on a full day scheduled excursion to one of the seven natural wonders of the world, Niagara Falls. Highlights include the Whirlpool Rapids, Floral Clock, the smallest chapel in the world and Brock’s Monuments. You will have time at leisure to explore on your own before returning to Toronto. Day at leisure to explore one of the most beautiful cities in the world including The Latin Quarter, Plains of Abraham, Ramparts, world famous Chateau Frontenac, National Assembly, Basilica, City Hall, Place Royale and Citadel. Travel back in time to rural Quebec and enjoy the view. You will pass through the many traditional villages of rural Quebec. In Sainte-Anne-de-Beaupré, you will be given time to visit the world famous Shrine. You will have the opportunity to stop at the Montmorency Falls and visit this exclusive site. For a taste of historic Montreal, spend a day exploring the 18th-century buildings of Vieux-Montréal, which now house small museums and souvenir shops. This flexible tour offers the best sights of Manhattan and Brooklyn. There are over 60 stops on these 4 different loops called Uptown, Downtown, Brooklyn and the Night Loop. Your ticket is valid for 48 hours. Your All Loops Double Decker pass is still valid today. The City of Boston is so compact and walk-able that you can see and do almost everything you want on foot. Some attractions in Boston are the MIT Museum, Harvard Museum of Natural History, New England Aquarium, Arnold Arboretum, Faneuil Hall & Quincy Market, Freedom Trail, Haymarket, Beacon Hill, Harvard University, Old State House, Museum of Fine Arts, Fenway Park (America's oldest and smallest baseball park), Newbury Street, The North End and Harvard Square.